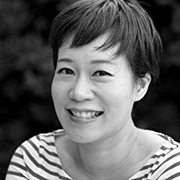 After abandoning an attempt to write a novel where an elephant is a detective (a novel she comically shuns on her website), Yangsze Choo began work on her spirited debut, The Ghost Bride. Li Lan, the daughter of a “genteel but bankrupt family,” is offered the astonishing chance to marry the powerful Lim family’s (recently-deceased) son. Night after night, she is drawn to the world of the afterlife (complete with ghost cities and vengeful spirits) by her deceased suitor, but she cannot deny her attraction to the Lim family’s new heir, Tian Bai. To avoid being trapped in the ghost world for eternity, she must discover the darkest secrets surrounding the Lim family. Yangsze Choo is currently considered a "single author." If one or more works are by a distinct, homonymous authors, go ahead and split the author. Yangsze Choo is composed of 1 name.